PARK RIDGE, Ill. (Jan. 15, 2018) – A new study commissioned by the Million Dollar Round Table (MDRT), conducted online by Harris Poll among over 2,000 U.S. adults ages 18 and older, including over 700 who currently work with a financial professional, examines what consumers think of financial professionals, what clients aim to achieve through financial planning and what they look for in a financial professional. 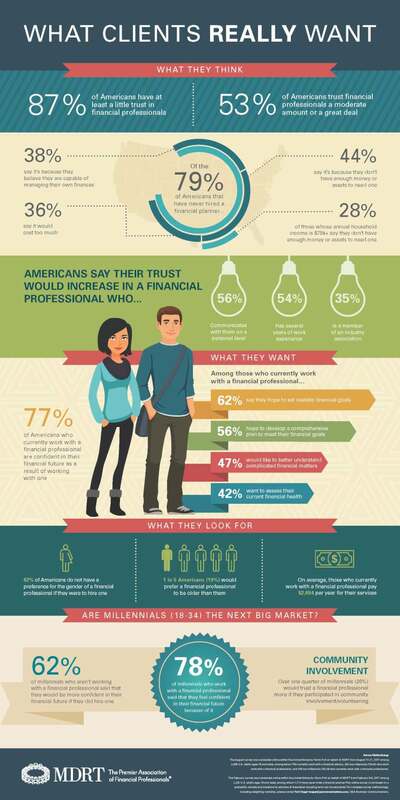 Of those who currently work with a financial professional, 77 percent say they are more confident in their financial future because they have the advice of a financial professional. The study found that 87 percent of Americans have at least some trust in financial professionals and 53 percent have a moderate amount or great deal of trust. Thirty five percent of Americans said their trust would increase in a financial professional if they are a member of an industry association, showing an opportunity for advisors to highlight how their memberships benefit their clients. In addition, over half of Americans say their trust would increase if a financial professional communicated with them on a personal level (56 percent) or had several years of work experience (54 percent). When it comes to hiring a financial professional, the vast majority (82 percent) of Americans do not have a preference in regards to gender. Nearly one in five (19 percent) Americans would prefer their financial professional to be older than them if they were to work with one. Among those who currently work with a financial professional, 62 percent say they hope to set realistic financial goals, 47 percent would like to better understand complicated financial matters and 42 percent want to assess their current financial health. The survey found that 62 percent of millennials (ages 18-34) who aren’t working with a financial professional said they would be more confident in their financial future if they did hire one. Also, 78 percent of millennials who work with a financial professional said they feel more confident in their financial future because they work with one. In addition, 26 percent of millennials noted community involvement and volunteering would increase their trust in a financial professional. For a high-resolution infographic that explores what clients really want and look for in a financial professional, please contact Isabella DiSanto at IDiSanto@gscommunications.com. This survey was conducted online within the United States by Harris Poll on behalf of MDRT from August 17-21, 2017 among 2,065 U.S. adults ages 18 and older, among whom 754 currently work with a financial advisor, 263 are millennials (18-34) who don’t work with a financial professional, and 106 are millennials (18-34) who currently work with a financial professional. This online survey is not based on a probability sample and therefore no estimate of theoretical sampling error can be calculated. For complete survey methodology, including weighting variables and subgroup sample sizes, please contact Tori Unger. Founded in 1927, Million Dollar Round Table (MDRT), The Premier Association of Financial Professionals®, is a global, independent association of more than 62,000 of the world's leading life insurance and financial services professionals from more than 500 companies in 69 nations and territories. MDRT members demonstrate exceptional professional knowledge, strict ethical conduct and outstanding client service. MDRT membership is recognized internationally as the standard of excellence in the life insurance and financial services business. For more information, please visit mdrt.org and follow them on Twitter @MDRtweet.